Where have all the Feld-Hells gone? No, this is not the title of a nostalgic folk song that I just composed! It is a Frequently Asked Question: how many were built and how many still exist today? The total production volume is usually estimated at 14 to 15 thousand units. I do not know exactly where this number originated, or how valid it is. This is one of the reasons that I have started collecting detailed information on surviving Feld-Hell machines. So far, I have captured information on about 185 complete and partial machines (latest update: 28 March 2019). The information is captured in this database. If you own, or have access to, a Feld-Hell machine, please provide me with all information (preferably in the form of clear photos) on the labels ("Typenschild") of the front and back of the machine's sub-units, as well as stamps and other markings. I have illustrated the information that I am looking for here. You can contact me here. 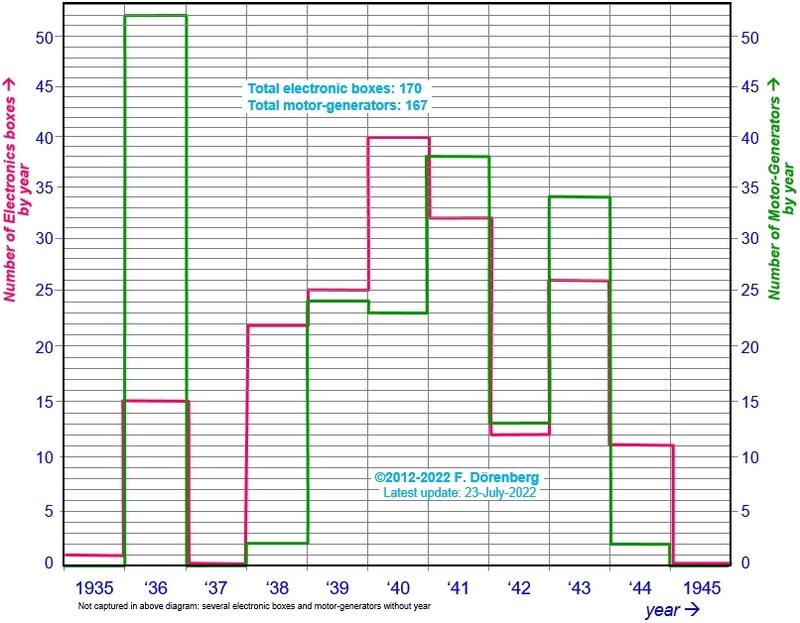 The graph below shows the number of Feld-Hell electronic boxes and motor-generators for the period 1935-1945, based on the information in my database. The total number of units is small compared to the estimated total production volume - about 1%. So, extrapolations to the actual production volume in each of those years (hence, the shape of the two curves) should be made very carefully. Not surprisingly, the graph suggests that the production volume surged towards 1940. That may correspond to equipage of an increasing number of Wehrmacht Signal Corps units for the invasion of France and the Low Countries. 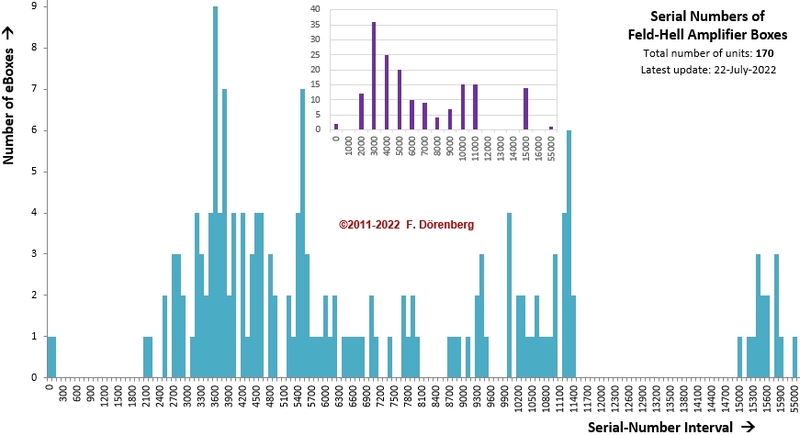 After those invasions, the production effort the German arms industry was clearly scaled back, even though planning for the invasion of the Soviet Union ("Unternehmen Barbarossa", Operation Barbarossa), was already in progress. That invasion started mid-1941. The hard-fought German defeat at Stalingrad in January of 1943 was a turning point, and the German retreat started after the Battle of Kursk during the summer of 1943. In parallel, the Tunisia Campaign ended with German surrender in May of 1943. This meant that during 1943, Wehrmacht Signal Corps units had to be re-formed and re-equipped. This may explain the production surge in that year, as is evident in the graph above. In Fig. 1 above, the 1935-1938 annual production volume for motor-generator and amplifier boxes is quite different; however, their sum over these years is basically identical. Note that the annual number of electronic boxes and motor-generator serial numbers in my database are not the same. On some of them, I have no information, whereas others are partial machines, or only a motor-generator or amplifier box. However, the total number is roughly the same. The Mende company produced a total of 4382 Feld-Hell machines during the years 1941-1943 (ref. 5). 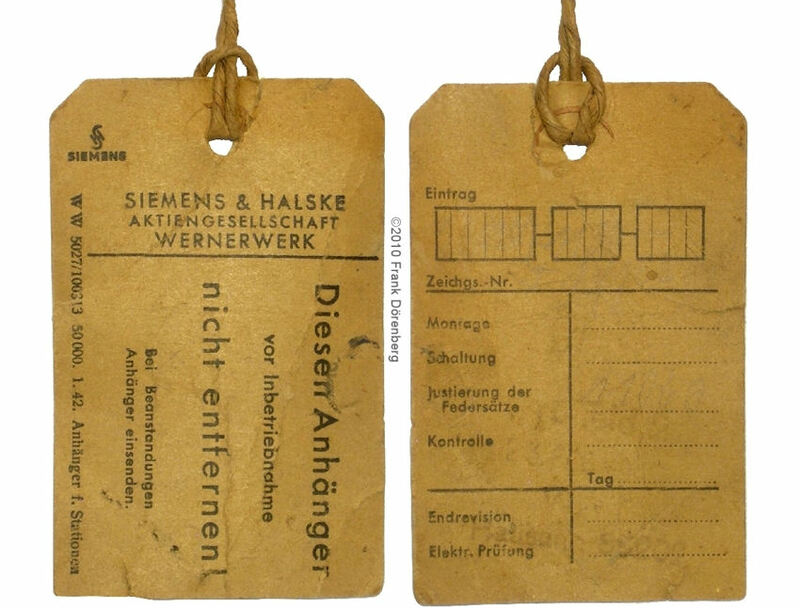 Assuming a relatively steady production during the (pre-war) years, Mende would have produced about half of the total, the other half being produced by Siemens-Halske. The lowest serial number of an electronics box: 0053 of 1936. The associated motor-generator, also from 1936, has serial number 10053.
so far, I have captured no electronics boxes that were manufactured in 1937 or 1945 (but this does not necessarily mean that none were built in those years...). 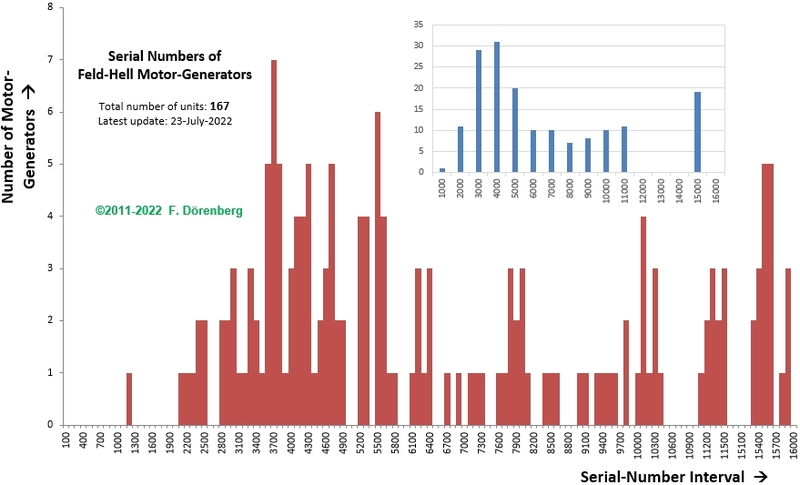 so far, I have captured no motor-generators that were manufactured in 1935, 1937, or 1945.
the 1936 peak production of motor-generators is followed by two years of (near) zero production. some motor-generators have different serial numbers on the front and the back (e.g., 5284/1941 and 23877/1941). with very few exceptions, only the label on the electronics boxes and the motor-generators has a year of manufacture. several base-units (the module below the motor-generator and keyboard) have a serial number that is much higher than those found on electronics boxes and a motor-generators (e.g., 21898/1940). Note: one should be careful when making statements about production volume, strictly based on serial numbers! Obviously, for spares provisioning and manufacturing stock, more sub-units where built than complete machines. Serial numbers of military equipment where not always assigned on a consecutive (running) numbering basis ("Durchnummerierung"). They were sometimes assigned in blocks that were not completely used. Also, consecutively manufactured units where sometimes assigned serial numbers from different blocks. This was primarily done to confuse the enemy, when trying to draw conclusions about production volumes based on serial numbers and date of manufacture that was marked on captured units (ref. p. 244. 437 in ref. 6). The two figures below show the blocks of serial numbers of the Feld-Hell amplifier boxes and motor-generators in my database. At the conclusion of the war, a directive was issued to the occupying forces (at least the western Allies), calling for the capture and destruction of all military equipment and materiel. Also, the public was ordered by the military government to surrender all telecommunications equipment (including carrier pigeons!). Ref. 1, 2. Of course, a search-and-grab was organized to systematically capture and carry off all items and intellectual property that was of value due to its advanced "high tech" nature (e.g., "Operation Paperclip"). Ref. 3, 4. Ref. 3: pp. 14, 56-62 in "Science, Technology and Reparations: Exploitation and Plunder in Postwar Germany", John Gimbel, Stanford Univ. Press, 1990, 280 pp., ISBN: 0804717613. Ref. 5: table on p. 47 of "Die Fertigung von Nachrichtengerät bei Radio Mende 1939 - 1945", Werner Thote, in "Funkgeschichte", Heft 117, 1998, pp. 46-51 (used with kind permission from the author and the publisher: Gesellschaft der Freunde der Geschichte des Funkwesens e.V. (GFGF). See note 1: due to copyright reasons, this file is in a password-protected directory. Contact me if you need access for research or personal study purposes.